While I’m not a big fan of the breathless quest for an optimized self, I do enjoy a productivity hack or two. For next week, here are four for you to consider. First, get up and walk away. When you get the creeping feeling that you’re not being productive, take note of where you are in the task, and get up and walk away. Do something else. Second, get better at saying no. Take a few minutes and write out three pleasant ways to say no to a request. Now, take out anything in your pleasant no’s that offers an excuse and what you have left is your way of saying no. “I’m sorry, that won’t work for me this time,” keeps new tasks off your list and makes you more productive. Third, schedule time for yourself. Take a look at next week and schedule a few 30-60 minute blocks of time for you to do whatever. Then stick to it. When you get a request that falls across that time slot, whip out one of your three no’s and keep your appointment with yourself. Fourth, get more sleep. When you have to get more done in less time, be rested. Schedule your bed time and your awake time and stick to it. If I have to be “awake Greg” at a meeting or presentation, I schedule two full nights of sleep beforehand. When my phone timer goes off at 10pm, I turn off “Ugly Delicious” and hit the sack. Try it. It’s all about how we’ve surrendered our personal data to the tech companies and hey, in exchange shouldn’t we be getting something more than ads for things we just bought following us around? I’ve talked about this subject before, like Data as Currency, and companies have been formed here and there around this concept. Like Wibson, YourBlock, Thrive, or Dabbl. Here’s the thing that struck me about this article, last week a friend asked if I could promote his event, Bitcoin Day. Now, I may be missing something but doesn’t selling your data rely on crypto technologies and blockchain? Why doesn’t the author talk about that? Maybe he, like many of us, just don’t know that much about such things. If that’s you, here’s a chance to learn. The bitcoin event is on May 5th here in Omaha. So if you’re here in town for Berkshire Days, find your way over to Bitcoin Day. Between both events, your brain will grow three sizes that day. And if you want to grab a cocktail later, let me know. I’ll be around. I mentioned I am working on a special value add-on on to my latest book, “The Human Being’s Guide to Business Growth,” and the pre-registration for this special item is ready to go. 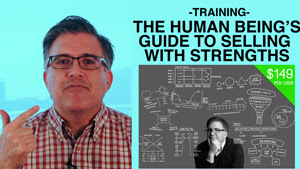 It’s a self-paced course I’m calling “The Human Being’s Guide to Selling with Strengths.” It takes the central concept of the book and helps you put it to use in your business right now. I’ve used this approach for new sales people, associates that want to grow their business, and partners that want to increase their effectiveness. It works. The course will be $149 when it launches, but for now it’s only $49. (if you click Take the Course you’ll see the $49) It includes a copy of an ebook, a physical copy, a forum for students where I respond to questions, and 30 minutes on the phone to apply the lessons to your specific business. It’s designed to prep your people for engaging with prospects while your leadership team works on strengthening Focus. Part 1, the course definitions, is available for free. It gives you a feel for how the course will go. I’m recording and editing sections 2 through 5 right now, and they will be uploaded each week, with the full course up June 1. If you just want the ebook, send me $5. If you want a physical copy of the book, send me $20, and if you want the book and the course for one person, send me $49. Easy peasy. Paypal it to greg@chamberspivot.com. I’ll follow up with details. Right FIT #164: Teach them well, Objections, Did I say that?